Soft Chocolate sponge layered indulgently with dark chocolaty ganache(Eggless) Soft chocolate sponge layered indulgently with dark chocolaty ganache. Savor Premium Belgium Chocolate Cakes If you are on the lookout to get your taste buds in a twirl, buy Belgium cakes & chocolates online at Smoor, for the best online chocolate shopping experience there is. Our skilled bakers have gone out of their way to design the most delicious range of eggless cakes for you to relish just as much as the other ones. We make it easy for you to order eggless chocolate cake online across Bangalore, with our reliable delivery services ensuring on-time deliverables. One can never go wrong with a gift of a cake on any special occasion. 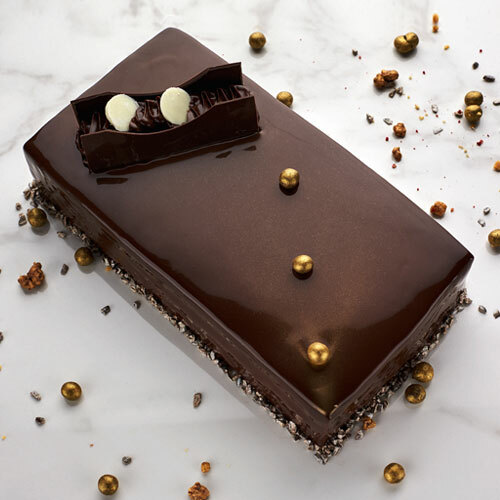 The Belgium chocolate cake features a soft chocolate sponge layered indulgently with dark chocolaty ganache to please your senses. Treat your friends, family, colleagues, and loved ones with the flavorsome Belgium chocolate cake made with love at Smoor available at the best prices across India.